Have you ever thought to watch and play your PowerPoint on your mobile phones or portable video players, and even YouTube? Wondershare PPT to video converter now makes it come true. It’s a PowerPoint to video converter which can convert PPT, PPTX to MP4, 3GP, AVI, WMV, FLV and other video files. It can be your ideal assistant of converting PPTX to MP4. Why Choose Wondershare PPTX to MP4 converter? 1. PPTX to MP4 converter converts your PowerPoint to MP4 video in high quality video output, you can replay your PowerPoint presentations with all animations, sounds and movies retained on iPod, iPhone, PSP and Apple TV. 2. 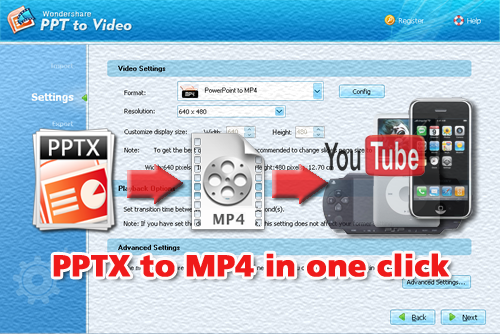 PPTX to MP4 converter allows you to customize the resolution of your output videos. It provides a Wide ranges of options of video resolutions from 320*240 to 1920*1080 for you to choose according to your needs. You can also adjust the width and height of Mp4 output manually as what size you like. 3. PPTX to MP4 converter allows you to make batch converting mode so you can import and convert up to 12 PowerPoint files at one time. It’s a quick and simple way to save your time on duplicate works. 4. PPTX to MP4 converter makes PowerPoint to MP4 converting process easy and smooth. Whether you are an experienced user or a beginner, by few mouse clicks you can generate PPTX to MP4 in minutes. The multi formats output is also available so that you can convert your PPTX to iPod, MP4, AVI, MOV, WMV, MPEG, FLV and 3GP with excellent quality and keep all the original animations and sound effects. Who will profit from PPTX to MP4 converter? With PPTX to MP4 converter, teachers can share PowerPoint lectures online for students. Managers can give training to the new employees with mobile phone. Software developer can make tutorials for software presentation and so on. PPT to video enriches the usability and enlarges the field of application of PowerPoint in portable players and devices, indicating the new way of knowledge sharing and spreading. Where to get PPTX to MP4 converter? To convert you PowerPoint to MP4 with PPT to video and begin the new experience of palm PPT, you can simply download PPT to video here. You will be deeply touched by the amazing features like easy-to-use and friendly interface, flexible settings for different screen size, high converting speed and excellent output quality.